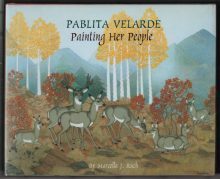 September 19th marks the 100th anniversary of the birth of Pablita Velarde, acclaimed Santa Clara painter and storyteller. Tse Tsan (Golden Dawn) is the Tewa name given to her by her grandmother at birth while Pablita is the name given to her when she started at St. Catherine’s Indian School in Santa Fe six years later. In 1932 Velarde joined Dorothy Dunn’s first group of students at The Studio School of the Santa Fe Indian School. While at the school, in addition to the encouragement she received from Dunn, Velarde met noted Cochiti artist Tonita Peňa, who set an important example for the young student. By age fifteen, Pablita exhibited a painting at the 1933 Chicago World’s Fair and by 1936 she became the first member of her family to graduate from high school. 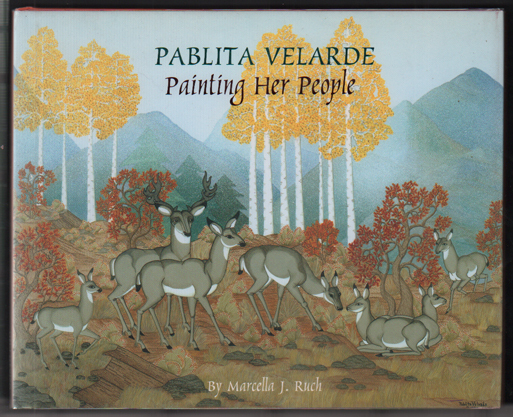 According to the label copy for the Pablita Velarde Studio currently on exhibit here at the Heard, she went on to become “a pioneer as a woman artist in an era and a community where painting was a male art form.” Velarde later became the first Pueblo Indian woman to be published with her 1960 book, Old Father, the story teller, combining her paintings with the Tewa stories told by her grandfathers. Here are four samples from the Library collection that discuss the life, the artwork and the legacy of an outspoken advocate for women’s rights. These examples by and about Pablita Velarde highlighting her more than seventy-year career are currently on display in the public reading area of the Library. Please feel free to visit the Library to review these or any other items of interest in the Library and Archives collections. For more details or additional collection information, click on the link labeled Library Catalog Search located in the pull-down menu of the Library tab on the Heard website.